There are two things that like this weather. Ducks and my lawn, so far but that will change when I get fungus soon. Nahh, Everything is leafed out and alive out there. That Maple is dead. I don't mind, too close to house, too many roots and not really shading the home since its on the East side. About 10 years ago my Rose of Sharon split. In the past few years, the right side has been VERY slow to leaf out, to the point where I think it's dead. But it manages to fully leaf out and produce buds so I let it stay. Sorry you now have to get a tree removed I'm sure that's a pain! Only 74 hours (3 days) of sun in last 492 hours (20.5 days)! Everything is slow to grow! Another 1/4" of rain overnight. Not a ton of rain past month (3.05") but there's been lack of sun. Clouds and Cold are a pain to crops. We need warming and sun. We had sun in Rehoboth today, but not this weekend for what they are saying. Guess I will have to sing louder. Where are you?! No general location in your profile header. I assume in the Eastern U.S? Planting in rain gear, now that's something I never done. We had sun in Rehoboth today, but not this weekend for what they are saying..
Yeah, sun came through after 2pm yesterday but came with haze and dim. Check it out.... I think I hear the plants clapping. 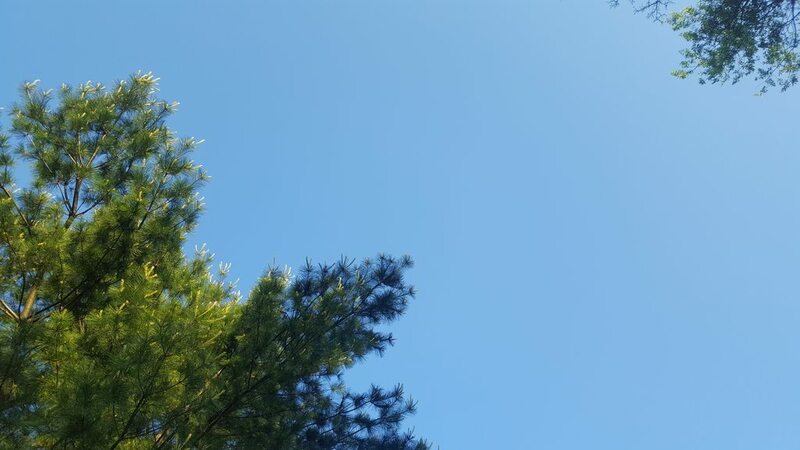 1st sunny blue sky morning since last week, May 26th. Only the 5th sunny morning since May 12th! It's bright and clear here also! Whoa, how sweet it is. Time to wake up these creaky old bones. Long Island N.Y. And if you think gear planting is a challenge, try screening compost from a wet pile. If gardening had a Marine Corps, I could be a drill instructor, rousing recruits out of bunks at 5:00 AM and having them out there with a steel rake and bulb plug cutter in a downpour shouting "You call yourself a GARDENER recruit??! !, now pick up that those two bags of topsoil and march them up the stairs to the deck planters ON THE DOUBLE!!!" Boy are those bags heavy when they are wet! I'm still afraid to cough for fear of getting a hernia from all those stomach muscles I twisted up, trying to get those bags out of my trunk. Here is a funny one along those lines. I bought 4 bags of soil along with other bags of dirt and put them in the garage and went my merry way mixing potting soil in and adding in some peat to get the mixture just right since I find potting soil too dry. I have a ton of pots so I rarely keep track of what I am planting while entering the "planting zone" every May. Suddenly, I realize "wow, I really used a lot of dirt, I thought I had bought enough." It didn't make sense but as I said, I was in that zone. So I go back to the store and buy 2 huge bags of garden soil 2 cu feet. (read HEAVY). I get home and pull into the garage and pull both bags out and put them on the floor between both cars. I had to go to the store and when I came back as I am pulling in, what do I see on the floor but the two bags of dirt right where I had left them, plus the two old bags for a total of 4. Enter, DH. Apparently, my sister was going to plant and he didn't realize that I was not done, so he gave her both bags, knowing that I would not mind and it would get them out of our garage and save her a trip. Guess who went back with the heavy bags!!! Seriously, I thought I had lost my mind. But when I get going planting, I have a tendency to get that way, so I didn't question it. Was too hot and humid to do much outside today. Just cant win. Lol. Dewpoints in the 70s. Oppressive. Good for the joints but it drains me out this weather and gives me migraines. Lol i bought StaGreen potting soil back in Februrary. Big mistake. It was water logged. What should of been like 30lbs ended up like 75lbs. I took it anyway but it was a pain from store to car, car to porch, porch to backyard.